I haven’t mentioned the Death of Superman in a while, so here’s a post about the Death of Superman. It’s only $5.33 for a $7.50 trade paperback, a $1.25 comic book, a “reprint” of Action Comics #1 (presumably just a reprint of the Superman content of that issue, judging by the apparent thickness) that – let’s say – is worth about a buck, and a poster that’s worth maybe another buck. So that’s about ten bucks worth of stuff for $5.33, which ain’t a bad deal, if a peculiar price point. I don’t remember if it was on this site, or on the Twitter, or maybe just in an email to a friend (which you better not have read!) 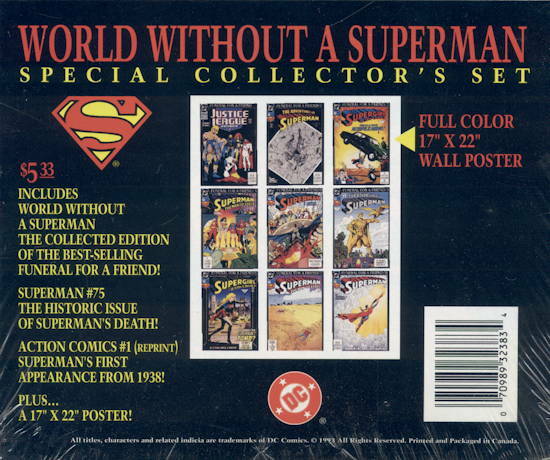 where I noted that while the cheapie Death of Superman trade DC rushed out right after the event had gone through some incredible number of printings, like twelve or fifteen or something like that, you could (at the time I was making this observation, a few years ago) still reorder the World Without a Superman book from Diamond Comics and receive a first printing. (It’s since been replaced by an edition with a $19.99 cover price.) 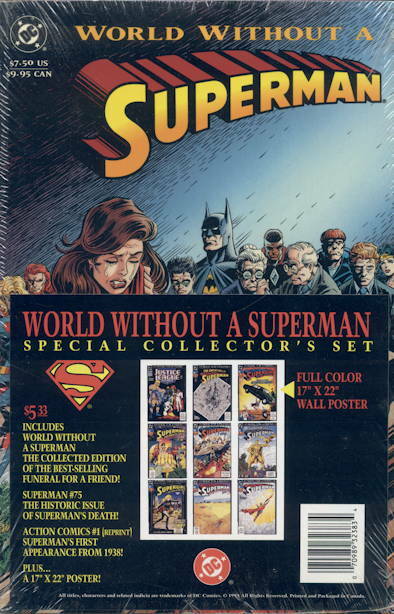 So they printed a lot of these books, and I wonder if this cut-price package was, while also being good marketing to take advantage of heightened interest in the Superman franchise, a desperate attempt to clear out some warehouse space. 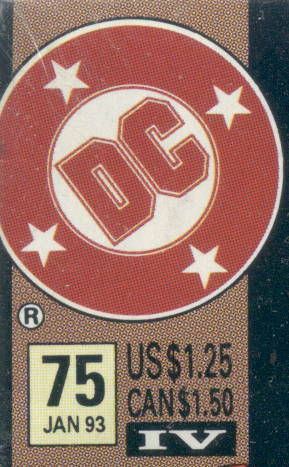 Remember when DC used to indicate printings with Roman numbers in the corner box? I wish they’d still do that, instead of what they do now with coloring the whole cover red, or printing “sketch” covers or whatever. …this would be a weird damn poster to have hanging on your wall. “Hey, remember that time Pa Kent collapsed in the field after a heart attack? …If only there were a constant reminder of that incident hanging up in my house somewhere.” Probably not as weird as this, but pretty darned close. I’m pretty sure most of Luthor’s history has been dumped post- Flashpoint , but man, even the whole “red-haired clone of Luthor” story that was going on at this point was basically unworkable prior to that due to other continuity-adjustments, if you really stopped to think about it. And I have. A lot. Maybe too much. 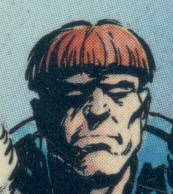 I don’t know why Sad Guy Gardner is striking me as funny. Maybe because he’s like super-angry and sad at the same time, which is totally in character and kind of awesome. 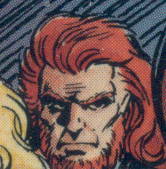 I’m not sure I even get what Bloodwynd’s whole deal was, even though I’m fairly certain I read the comics explaining the backstory at the time, and just now I looked at the Wikipedia entry and got that whole “reading other people’s mail” vibe I usually get when, for example, I read an X-Men comic or actually read other people’s mail. Also, his name sounds like a band that should be on a bill with Shadowfax, so long as we’re picking on a character that hasn’t been seen for about a decade. So, anyway, the Death of Superman…nearly twenty years on, and there’s still no escaping from it. I expect that after I die, my condemned spirit will wander the world like Jacob Marley’s, weighed down by chains attached to long comic boxes filled with Adventures of Superman #500. Aw. 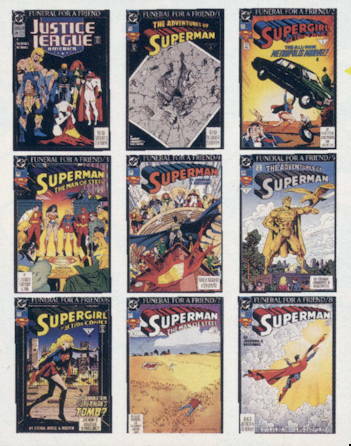 Just looking at these covers makes me remember Super-Bibbo and, well, now I’ve got sumpthin’ in my eye. I thought these were on average the best issues of the whole mess– much better than the preceding slugfest Death, and a bit better than the subsequent Return. Agreed. The writers did a good job portraying the different characters trying to move on after the death. I run the comics section at a Half-Price Books in Seattle. I see Death of Superman related books every so often, but nowhere near as often as X-Men family titles and Image books from the same era. No one wants to buy old issues of WildC.A.T.S., not even out of the quarter bin. Those special combo packs were how I got a lot of my comics as a kid, but most of mine were comics, not trade paperbacks. You got a complete storyline, generally with 2nd prints or later of the “key” issues, or a trade paperback of a storyline, plus some kind of extras, generally cards or a poster. A few had subscription offers at lower prices than the in-house ads offered. Most of them were five bucks at Wal-Mart, K-Mart, or Shopko. I got X-Men: Fatal Attractions, Flash: Terminal Velocity, Death of Superman, World Without a Superman, Emerald Twilight (with the first 4 or 5 issues of the Kyle Rayner stuff thrown in), and chunks of a bunch of the lesser X-titles. There were also random packs of 5 comics for $2-$3 (with a few bonus trading cards), which were always disappointing. There would always be one X-book that you actually wanted, which would be the one you could see in front, and then the rest of the bag would be 2 Deathloks, a Namor, and a Ravage 2099. I saw one of those Flash: Terminal Velocity packs recently that still had the cardstock wraparound cover that came with the set. Nice packaging. The oddest version of this type of bundle repackaging I ever came across was a handful of Marvel issues that had the spines cut off and were bound together, ads and all, as a TPB with a title something to the effect of “Marvel Comics Best of 199-whatever”. Nice way to reuse some of your overstock, I suppose. Didn’t Bloodwynd turn out to be J’onn J’onzz? Like, he got hit so hard by someone he turned into another super-hero? I’m pretty sure it was the martian manhunter. Wow. That is a fact that is taking up actual space in my brain. Mike, you actually make the same Bloodwynd reference in the linked post, and reference the subject of Rande’s question. based on its spelling. I assume its supposed to be wind as in wind blows, and that’s how I’ve been saying it for decades. Huh. I actually thought the “Bloodwynd is really just J’onn pretending to be another super identity” plot was kind of neat… until they revealed that Bloodwynd was *also* an actual real separate character. It’s a cooler idea if it’s just J’onn making up a new fake identity, and it’s a pretty crappy one, because he’s not a very good comic book writer. Many years ago (late 80s?) I bought one of those grab bags of “less successful” titles (can’t recall what was on top), and inside got a copy of the “Anatomy Lesson” issue of Swamp Thing. I was very pleased, and have never been so lucky again since.